New software updates of STAR Atlas:PRO™ for the same version number will continue to be freely available to all registered users. This means if you own Version 6 then you will get free software updates to any version 6 update such as version 6.1, version 6.2, version 6.3 and so on. Major upgrades to new Versions can be purchased at a discounted price. 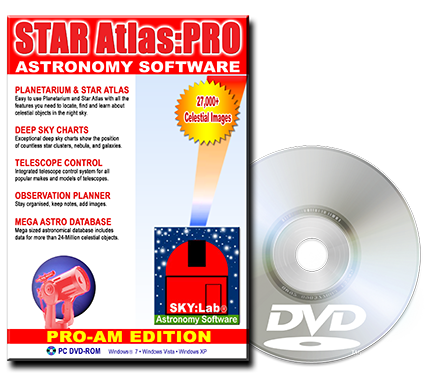 You must supply your current STAR Atlas:PRO Personal CD-Key number to qualify. Major Upgrades are suitable when new versions of the software are released such as the PRO-AM Edition and you would like to upgrade your current older version to the latest edition.